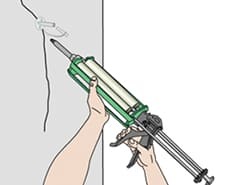 Crack injection systems are designed to penetrate the full depth and length of cracks in concrete walls and floors. The basic method of repair is to install plastic ports over the cracks, and then apply a coating of epoxy over the entire crack prior to injection. Once the coating has cured either epoxy or polyurethane can be pressure injected. Epoxy resins are injected to regain structural integrity of broken concrete in conjunction with other wall repair systems. Polyurethane resins are injected to stop water intrusion and create a flexible seal in broken concrete and in larger voids.